look and taste best with them! Slice some up! Jay Ducote is on fire these days. He has a new line of food products and clothing/accessories, a new TV show, and he will soon have a restaurant! The man is living the dream and we all wish him the best! I have wanted to try out a sweet pickle braised pork shoulder for about a year now. Yes, you read that right - sweet pickles! I just had a feeling it would be fantastic, but I put it on the back burner, so to speak. I now know why. If I'd made it a year ago, I am certain it would have been good, but it wouldn't have utilized two key ingredients - my Instant Pot and Jay's Louisiana Barbecue Sauce. I'm glad I waited! Place the pork shoulder in the liner of the Instant Pot. Sprinkle the pork with the salt, red pepper flakes, sweet pickle relish and the barbecue sauce. Close the Instant Pot top and set to Sealing. Cook on Manual for 70 minutes and then do a quick release. Remove the pork and de-fat and reserve the remaining liquid (I use this tool). Discard the fat. Shred the pork and sprinkle 2-3 tablespoons of the de-fatted cooking liquid over the meat. Discard remaining cooking liquid. Place the pork on a rimmed baking sheet and broil in the oven for a few minutes, until just beginning to brown (this step is optional, the pork can be served without broiling). 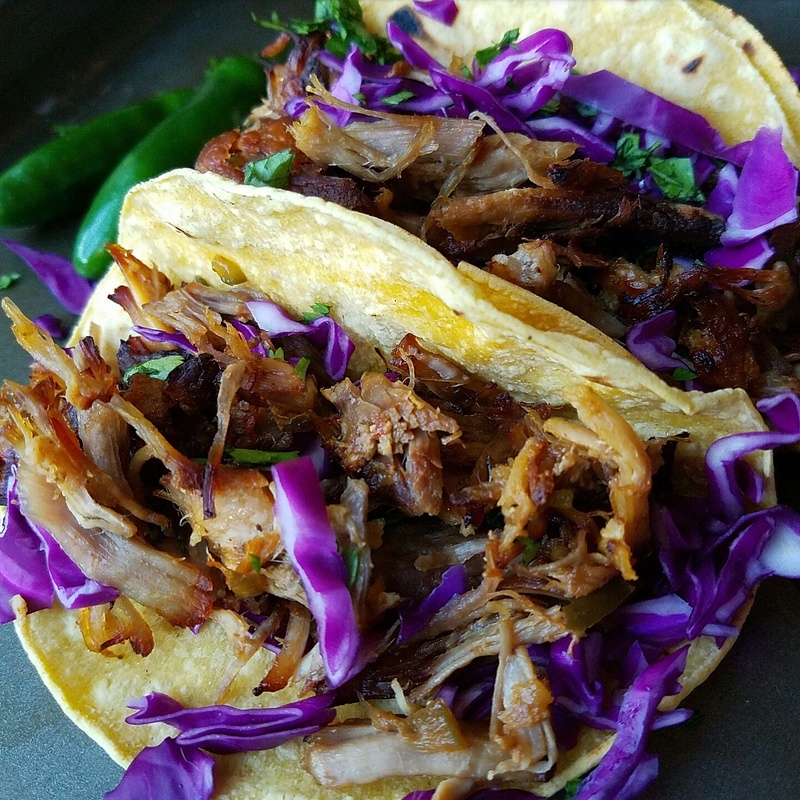 Serve the pork on warm corn tortillas with shredded purple cabbage, sliced fresh jalapenos, chopped cilantro, and chopped onion, to taste. Add more barbecue sauce if desired. *If you prefer, you can brown the pork shoulder with some olive oil using the sauté function on the Instant Pot. I did not notice any difference in flavor or texture when I tested this dish both ways, so in the future I will skip it and just pressure cook the meat without browning it.